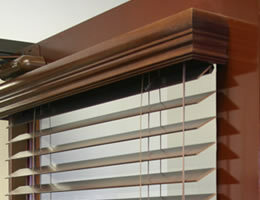 Each real wooden blind is made from top quality components and wood slats. Our "traditional look" Summit 2 Inch Wood Blinds will look great in any window and are sure to complement any home decor. Each real wood blind comes standard with a crown molding valance and cord tilt only. On inside mount blinds, choose between the traditional crown valance that fits inside the window frame with the blinds or add a "cornice style" valance. The "cornice style" valance is a crown molding valance that sits outside the window frame and has returns for a more elegant look. Currently we are experiencing a 4-5 week delivery time on this product. The Summit 2" Wood Blinds are made of Basswood. The ordering process was extremely easy. We received our blinds 3 weeks after ordering and we love them. They are very well constructed and look beautiful in our home. I will definitely be ordering more! I highly recommend Blinds Chalet! This is the second time I’ve ordered from Blinds Chalet because I was so happy the first time. This is the second time I’ve ordered from Blinds Chalet because I was so happy the first time. The blinds came right away and they were exactly as I ordered. I definitely recommend this company to anyone. Thank you for making it so easy to order and install. Blindschalet has been so helpful to me. Blindschalet has been so helpful to me. the product is outstanding. it looks exactly the way it does in the pictures. I would highly recommend them. We have bought four of these for the main floor living area, they are absolutely GORGEOUS! We have bought four of these for the main floor living area, they are absolutely GORGEOUS! Packaging was great, although there were no instructions included nor were the different sizes labeled -although they were still very easy to install and figure out. I will get more of these for the rest of the house. The item was pretty easy to install. The item was pretty easy to install. In order to make sure the blinds looked like a professional install, I used a laser level and an impact drill to drive anchors into the wall. The total job took about 2 1/2 hours for 3 blinds and 2 of the 3 were over 70 long.